Start your review of Nate Bryant. My name is Nate Bryant I am a Kent local born and raised! I grew up hunting, fishing, shooting, and always loved playing with motors. God bless America! "First experience and it was great. " The employees were very friendly and punctual. I called to test drive the vehicle and it was ready when I got there and while Nate and I drove, he asked questions to understand my personal situation so as to get the best deal for me. I felt welcomed and respected from the minute I walked through the door. I drove from Chicago to look at a car that was listed on Carfax at this dealership. I was very nervous about driving that far and then not feeling comfortable with the service, but that went away in the first 5 minutes I was there. I was not pressured to purchase the car, but Nate spent a lot of time explaining the car, all of the functions that I was not familiar with, and all before even taking it for a test drive. All the people I worked with were extremely nice and friendly. Nate was fantastic, easy to work with, very polite and respectful of my time. Even knowing it is a 6 1/2 hour drive, I will definitely go back to them for any future car purchases. I like Klaben Ford due in the most part to its staff. Nate Bryant is a tremendous help in finding just the right vehicle for me and takes the time to put everything together before I get there! I do not like sitting around at the dealership as I am quite busy and Nate made sure that he expedited all facets of the car buying process! Christine Klaben in the finance department was very helpful and quite nice. She didn't attempt to push anything on me that I was not interested in. She was extremely quick to get the paperwork finished and being the third purchase I have made from Klaben, I can attest to the fact that everything that I have stated to this point has occurred each time. Thank you for your great service! Great salesperson in Nate Bryant., Rest of the staff (finance) were great also. It just seemed to take an ununderstandably long time to finish the transaction. (No financing needed). They need to work on that. When they took the car to be prepared for delivery to me they checked the tires for air pressure and left off one of the valve caps., Not a biggie, but details matter. "Nate Bryant - excellent salesman!" Second time leasing with Nate and Klaben - always a great experience with an honest & very personable salesperson like Nate and his colleagues. Have recommended him and Klaben to friends. Nate, Chris and Christine were a real joy to work with. They really helped put us in the car we wanted even though it wasn't easy to get us where we needed to be. We will be back!! 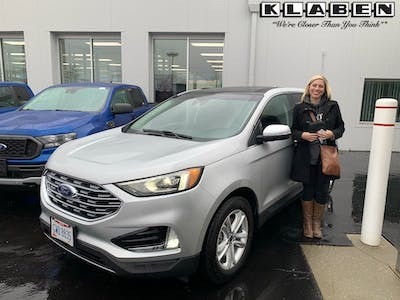 "Leased a 2019 Ford Escapr"
We had a fantastic first time experience at Klaben Ford in Kent this past Saturday. Nate Bryant was easy to work with, incredibly knowledgeable about all of the products (we tested other options as well), and thoroughly answered all of my questions. It was a hassle free process and made our weekend being able to drive away in our brand new ride! The service provided by Klaben this last week was second to none. Nate was an excellent help through the entire process and really made things easy on our side. 10/10 would recommend!